Finnish mobile manufacturer Nokia has claimed that the new Google Nexus 7 tablet infringes on some of its patents. The Inquirer reports that a spokesperson for Nokia revealed that the Nexus 7 is not licensed to use some of its patents. The spokesperson said: "Nokia has more than 40 licensees, mainly for its standards essential patent portfolio, including most of the mobile device manufacturers. Neither Google nor Asus is licensed under our patent portfolio. They go on to state that it's not difficult for Google or Asus to get a license for particular patents, with the process being a simple one: "Companies who are not yet licensed under our standard essential patents should simply approach us and sign up for a license." It's thought that Nokia is unlikely to push for a sales ban, avoiding the Apple way of doing things, instead insisting that Google/Asus sign up for the required licences. 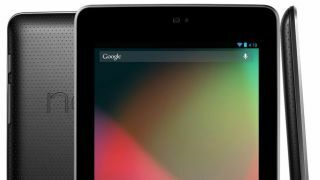 The Google Nexus 7 is the search giant's first own-brand tablet, and it sports a 7-inch display, quad-core processor and runs Android 4.1 Jelly Bean, while rocking up with the highly attractive price tag of £159 ($199). TechRadar contacted Nokia to find out more information, but the firm declined to add to its statement above. We've also contacted Google and Asus for further comments and we'll update this article once we hear back. Update: An Asus spokesperson has told TechRadar: "ASUS will not be providing comment on the claims of patent infringement."